This study by Lee Edwards, Giles Moss and Kristina Karvelyte from the University of Leeds aims to respond to a call in previous research for greater public deliberation about copyright policy. It is underpinned by the principle that copyright policy is a matter of public interest, and as such, should be a subject of public discussion and debate, so that the eventual implementation of copyright is one that attracts a general level of agreement among all affected parties. The research builds on an earlier project (Grant reference ESRC RES 062-23-3027) that examined the ways in which copyright was understood and evaluated by industry, activist groups and users. This work argued that users should be viewed as ‘sources of legitimate justifications rather than dysfunctional consumers to be educated or prosecuted’ and identified the need for a more deliberative and democratic process of copyright policymaking. However, little research has delved further into public opinions about copyright, explored how they might be formed, and considered what might happen when members of the public are given a broader range of information about copyright from which to form their opinions. 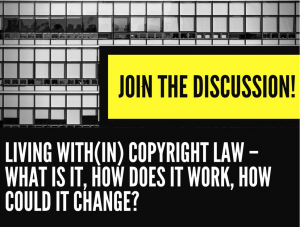 The purpose of this research project was to investigate how people would engage with a deliberative process, where they were given the time and space and a range of information to reflect on the complex issue of copyright. 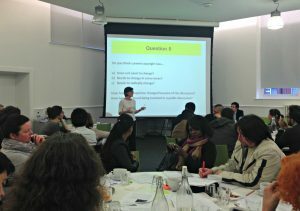 Central to the ‘Living With(in) Copyright Law’ project was an event of the same name that brought 88 members of the Leeds public together over one weekend to discuss the nature of copyright law, its implementation, and ways it might change. Participants were provided with information about copyright from advocates and experts in the field and then asked to discuss key questions related to copyright duration, copyright exceptions, and copyright enforcement and penalties. The researchers found that the participants engaged enthusiastically with the event and that the deliberative process increased their knowledge of the subject, generated reflective critique and provided them with a broader basis for their understanding. The team adopted an unusual methodological approach to the study in order to be able to find out as much as possible about people’s engagement during the event. No specialist knowledge of copyright was required of participants, although some had more detailed knowledge than others. The assumption was made that their understanding of copyright would be a product of the current information and media environment, as well as their own personal and work lives. The materials provided for the event drew on news stories and examples of how copyright is used in day-to-day life and popular culture, in order to reflect the different ways in which copyright is discussed. Participants engaged enthusiastically, and welcomed the opportunity to discuss copyright. They offered their own perspectives and ideas about how it currently works and how it might be altered to work better in practice, including some genuinely new and occasionally radical insights. This suggests that the public should be involved more frequently and more effectively as a potentially insightful partner in discussions about the future of copyright. Participants drew on a range of sources of evidence about copyright in their discussions, including their own lives, news stories and popular culture. They critiqued the justifications of copyright that they encountered, actively reflected on their own position, and showed a clear understanding of the difficulties of implementing copyright in a complex economic and technological environment. The depth of their engagement demonstrates the potential value of structuring copyright debates in a more democratic and inclusive way. Before the event, participants drew on a limited set of justifications to define their positions on copyright (primarily based on the logic of market, civic and domestic worlds); by the end of the event their views consolidated around a justification of copyright in terms of civic, rather than market interests, prioritising the public domain in copyright law. Many participants began the event with limited knowledge of copyright policy (particularly copyright permissions/exceptions and enforcement/penalties), leading to a high level of ‘don’t know’ responses to the survey questions. By the end of the event, ‘don’t know’ responses reduced dramatically, showing that participants had developed a greater understanding of the area and felt more able to offer opinions about different aspects of copyright policy. Different demographic groups varied in their opinions about copyright, although there was no clear pattern to the variation. Future research should ensure diversity of participants, so that more information about the differences between groups can be gathered. Participants noted the absence of corporate and artist voices from the event, and would have appreciated their participation. Future research should ensure that all parties affected by the copyright debate – industry, artists, creators, activists, users and others – are equally represented in deliberative discussions, so that their positions can be fully considered by participants. This entry was posted in CREATe Blog, News, Working Papers. Bookmark the permalink.